Of course, with the active pickups, vintage buffs and fashionistas may turn up their noses, but for the rest of us - you won’t be disappointed. Design, build, sounds, price! Neck; more Kalamazoo-like vibe. The wiring doesn’t illustrate the potential of the pickups. 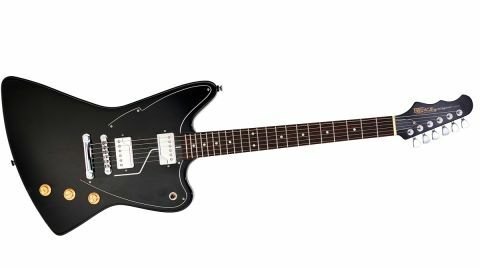 The none-more-black Esprit uses agathis for its original Jazzmaster-meets-Explorer body and a maple set-neck, with a 22-fret ’board, while its dual humbuckers and ubiquitous tune-o-matic/stud tailpiece combo and shorter scale of 635mm (25 inches) fill the Gibson-esque slot. so potentially you can have Voice 1 on the bridge, for example, and Voice 2 on the neck. There’s only one switch wired here, however, so that’s not possible. Still, the voices of each humbucker are slightly different: the neck humbucker offers ‘Vintage Humbucker’ (Voice 1) or ‘Clear, Airy Chime’ (Voice 2), while the bridge goes for ‘Vintage PAF’ (Voice 1) and the over- wound-style ‘Classic Hotrod’ (Voice 2). From a critical standpoint, the Esprit It really doesn’t disappoint... and that’s just the neck with it’s fabulous clubby C profile that’s only a shade thinner than this writer’s old ’57 Junior. There’s a smooth attack to the note but plenty of sparkle, and starting clean it summons up James Honeyman-Scott’s work with The Pretenders - jangle and bite. Into a little Vox AC10, we may have found a near-perfect small volume recording setup, although with the subtly shorter 635mm scale length (as opposed to 648mm) and its surprisingly resonant, lightweight construction, we’d definitely go for bigger strings. this with a Yamaha SG1820 equipped with the same pickups illustrates the point: the Esprit has the rawer edge to the thicker, more Les Paul-like sound of the SG. Same microphones, different voices. Credit where it’s due, these are simply very good guitars. With the huge experience and production nous of Trev Wilkinson, Fishman’s Fluence technology and what seem to be extremely competitive prices, we’re struggling to think of a player who couldn’t use these. And if you’re handy with a soldering iron, you can tweak the wiring for considerably more ‘voices’.